Service Area: North Oaks and surrounding Metro area communities including Arden Hills, Lino Lakes, Mounds View, New Brighton, Shoreview, Vadnais Heights and White Bear Lake. 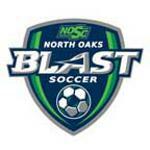 The North Oaks Soccer Club provides a unique development experience for players and families looking for intensified technical skill work that will help players understand the tactical elements of the game. Blast players dare to D.R.E.A.M. (Discipline, Responsibility, Effort, Attitude, Motivation). The Blast journey requires commitment and a deep dedication to attaining high-level goals. In this quest, players discover what they are capable of achieving not only as athletes, but as teammates and as people. Through discipline and responsibility they put forward a high effort with a positive attitude to learn about achieving success in other areas of their lives.